1x Strelkovy HQ with full Pioneer Platoon, 1x HMG Company with 4x guns, 1x Regimental Gun Company (4x 76mm obr 1927 guns), 1x Mortar Company (9x 81mm mortars), 1x Heavy Mortar Company (6x 120mm mortars), 4x Flame-throwers. So to help out my infantry I've decided to do up some gun teams. There are a lot of guns, in typical Soviet tradition, so I thought it would be a good idea to have a plan on how to tackle a large number of troops in an efficient and speedy manner. To help conserve my time spent painting, I decided to do something similar to my Free French guns and magnetize them so that I can swap out for the guns I need. The 122mm obr 1938 is a easy gun to magnetize owing to its flat surface under the gun. Other guns are a bit tricker such as the 76mm ZiS 3, which will require a bit of green-stuff work to create a surface to glue the magnet to. There are a lot of large-base gun teams and using some clever positioning of the troops on the base, I should be able to field split-trail and single-trail guns on my large bases. This would allow me to paint a limited number of bases and then swap out the guns when needed. Keeping the figures away from the center line will make the base compatible with single-trail weapons, but make sure there is enough room for the split trail of other weapons. Always 'dry fit' all of the types of guns you intend to use on your base before gluing the figures down. This helps you guarantee that the crew's positions won't interfere with the gun's space. It's worth doing a second dry fitting once all of your spackling or basing material is dry. This is a good time to make sure the guns will sit on the level and you don't have a trail or a wheel sticking up in the air. The next question was how many bases I thought I was likely to need in an army at a given time. I had a look at the various Soviet support platoons in Mid War, as that's where the largest platoon sizes are currently. It looks like a full God of War Battery was a good target for this first batch, so I settled on 12 bases. The maximum I'll probably need is a total of 24 (GoW=12, AT Platoon=4, and Reserve Artillery=8), but 12 suits my ambition just at the moment! About 50% of the bases I need! Next I sorted out 12 crews for the bases, cleaned them up and attached them all to popsicle sticks. The trick here is make sure that all of the similar poses are placed on the same stick in the same direction. This helps with speed painting. Once all those were painted, I assembled a sample of each type of gun I plan to magnetize to the base. There were several I wanted to do, but the trick is to make sure that the configuration of figures on the base will allow for both split trail (such as the 122 obr 1938 howitzer) and single trail guns (such as the 76mm obr 1902 gun). 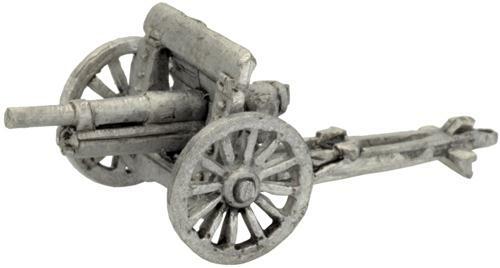 If you get that right, you can magnetize any gun, such as 57mm ZiS 2, 76mm ZiS 3, and 152mm howitzers and guns. Anyway, once the guns have been assembled and the crew glued to the bases, its a pretty straight forward process from there. So, that's what I've been up to this week! I just need to finish the basing and paint up the guns. So I should have a final article on these guns ready next week. Thanks for reading! Initial thought is that this is inspirational, but it rapidly approaches daunting. Great work Mike! Aren't you clever? That is a really good stuff with the dry-fitting and planning the bases. It could be applied to any game where the scenic elements of the base and various sized models all need to interact. Well done! Way off topic, the season is almost upon us. Good thing the Astro's joined the AL West so Seattle doesn't have to be last anymore! What the what?! Teams switching leagues messes with my mind! But that'll be nice for Seattle! "We'll start the war from right here!"